One of the major causes for increasing pollution is wastes and scraps materials which are not properly recycled. It has been found that more than 40 percent of the pollution in Asian countries has been dedicated to no recycling system, where disposable items are thrown away after use and it has become a major dilemma for most countries around the world. Ovetto is one of such recycling device which will be highly recommended by Go Green favors. Taking the idea of recycling and clean will clear much of our environment and provision of many benefits. Education: a project which is aimed to aware the people about recycling and its benefits as well as to start cleaning from their own homes. Solidarity: proper waste and management and establishment of authorities for it will create more job opportunities and awareness among the lower classes about how effective Go Green approach will be. 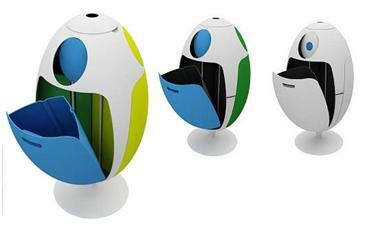 There are many benefits being associated with this this new egg shaped recycle bin. Here are some of the benefits which one will experience from this Ovetto recycle bin. Taking the idea of logical clean and design from an Italian architect, this recycle bin has been developed by Gianluca Soldi as its director and was presented in London Design festival last week. Your living environment will be cleaned from excess of paper, wastes, bottles, plastic disposables and cardboards. This is the best designed object every, your bin will match with your interior colors of home and best designed objective to get people attention. It has more storage volume, which is 90l being much more than 25 l or even 50 l and you will have more volume to gather your domestic wasted materials. It has maximum volume capacity because it can shrink the plastic bottles and will give you more space to take the wastes away from your home. 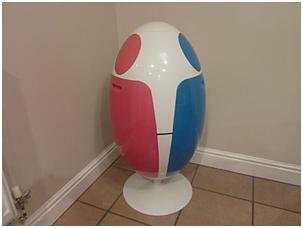 Based on our current requirements to keep our environment green and preservation of green life, this plastic egg recycle bin is the best solution.